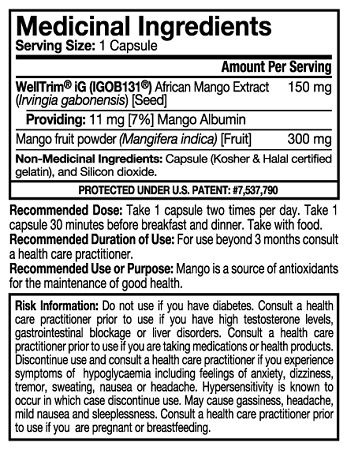 WellTrim® iG (IGOB131®) is known as ‘THE ORIGINAL AFRICAN MANGO EXTRACT’ and is the only clinically-proven, certified authentic African Mango protected under US Patent #7,537,790. Mango is a source of antioxidants for the maintenance of good health. RECOMMENDED USE OR PURPOSE: Helps control body weight when used with a healthy lifestyle incorporating calorie-reduced diet and regular physical activity. Helps support healthy glucose balance. Helps support healthy cholesterol levels. Helps supports cardiovascular health by reducing bad LDL cholesterol levels. Provides a source of antioxidants for the maintenance of good health. Q: What does this product do? 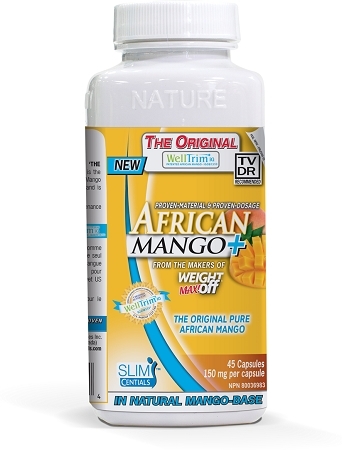 A: SlimCentials African Mango+ is made exclusively with WellTrim iG® - The only clinically proven form of African Mango available on the market! Q: How many pills per day? How many times a day? Best way to use this product? A: The clinically proven dosage for this product is one (1) capsule twice (2x) daily 15-30 minutes prior to your two largest meals with 250 ml of water. If you have forgotten to take 15-30 minutes prior to your meal still take it before beginning your meal. Thank you for your question! You want to take 1 capsule about 30 minutes before your 2 largest meals of the day, with a glass of water. Feel free to email us directly at info@nuvocare.com as well. Q: Is this product is vegan?